It’s hard to believe how quickly the summer is going by and the Fourth is less than a week away! I have been wearing white excessively these days and have been all about adding any/all white clothing items to my collection. I stumbled upon this dress while scouring the Ann Taylor site from an email alert I received. The “EXTRA 50% off sale” first drew me in and then I found this in the sale section and realized that is would ring in at under $50. The length of this dress is a little different for me. looser fit midi style dress. It’s easy for the dress to look overwhelming on my frame and make me look a little stumpy. Now for the perfect bag to make the outfit complete. PLUS did you catch the back of the dress?? It is complete eyelet and for me (I am OBSESSED with an interesting back on any article of clothing) I just knew it would be perfect in my closet. This bag from Banana Republic I have been eyeing for a looong time. bit so this is a great alternative. The real suede exterior in the great tan color really goes with anything. Also, not sure if you can see it, but there are two pockets so it is really roomy. Great for carrying all one thousand little knickknacks I have to have with me at all times. Depending on what your Fourth plans are this is a great outfit idea for a barbecue or dinner plans before fireworks. I still don’t have any solid plans on how I will be celebrating but may have to break this number out again next week to watch the fireworks. You look fabulous! 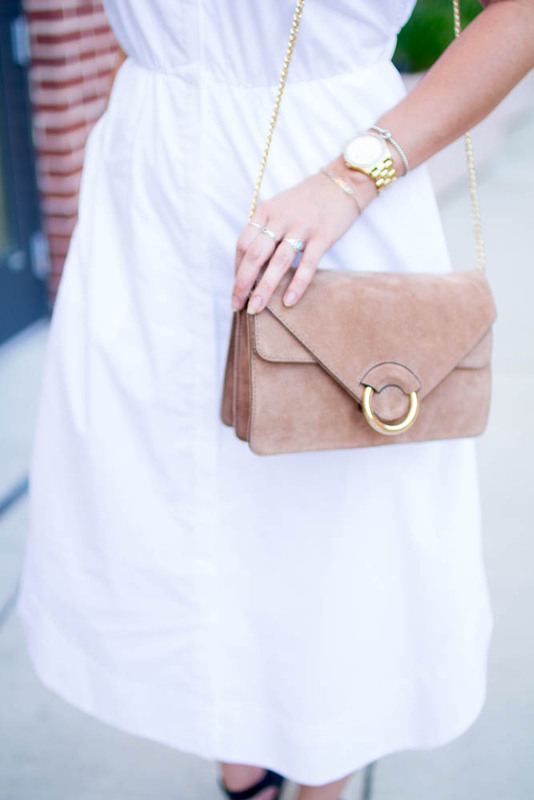 Loving this midi dress and I'm drooling over that bag! So gorgeous! I also can't believe how quickly the summer is flying by. I hate that - this is my favourite time of year and I want it to last longer! Absolutely adorable summer outfit. Banana has some amazing goodies right now! Girl, this dress is so gorgeous. I fell in love with it instantly and it looks so stunning on you! I'm kind of obsessed with this! It's so simple and chic! Shop PromDresses2017 for cheap long prom gowns online. Prom ball gowns and evening gowns for pageants. Long strapless dresses, sequin gowns, and mermaid dresses.